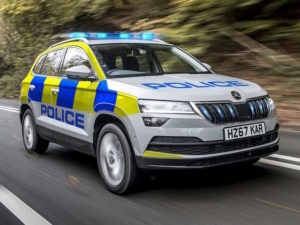 Škoda’s Karoq compact SUV has been given the blue light treatment to equip it as a rapid response vehicle for fire and rescue, ambulance and police applications. Following in the footsteps of its Kodiaq bigger brother, the Karoq can now be fully converted to suit specific requirements, with breakdown recovery, service, maintenance and repair requirements also built into the conversion package. The conversion brings 360-degree visibility with the help of LED signal lights built into the front screen, grill, tailgate and number plate plus a 100-amp three-tone siren. The Karoq also brings boot space of 521 litres, rising to 1,810 litres that can be specially converted to suit operational requirements, and driver assistance systems including Adaptive Cruise Control, Blind Spot Detect and Front Assist including City Emergency Brake and Pedestrian monitor. Offroad capabilities are available from a 148bhp 2.0 TDI while the 2WD engine line-up features a 113bhp 2.0 TDI unit and two TSI petrol units with outputs of 113bhp and 148bhp; all are available with a seven-speed DSG transmission. Škoda also recently introduced a ‘one-stop shop’ package for emergency services fleets, which allows vehicles to be purchased directly or financed through Volkswagen Financial Services with a range of finance solutions.